Thunderbolt™ is the brand name of a hardware interface developed initially by Apple and Intel that allows the connection of external peripherals to a computer. 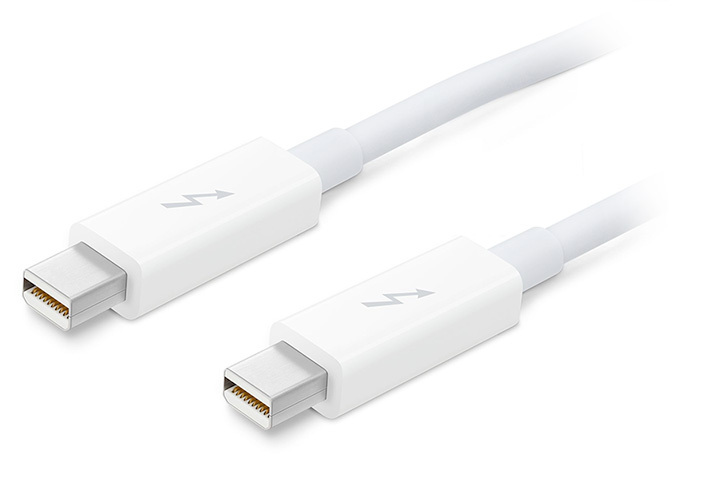 Thunderbolt 1 and 2 use the same connector as Mini DisplayPort (MDP), whereas Thunderbolt 3 uses USB Type-C. It was initially developed and marketed under the name Light Peak, and first consumer products rolled out to the market in 2011. Thunderbolt combines PCI Express (PCIe) and DisplayPort (DP) into two serial signals, and additionally provides DC power, all across one cable. Since Thunderbolt uses the DisplayPort protocol for video display, you can connect any DisplayPort, DVI, HDMI, or VGA display using existing applicable adapters. For systems that include Thunderbolt™ 2, users can take advantage of transfer speeds of up to 20Gbps, with support for DisplayPort 1.2. Thunderbolt 2 workstations and laptops are backwards compatible with original Thunderbolt devices and Thunderbolt 2 uses the same cables and connectors. Thunderbolt 3 doubles the throughput again to 40Gbps and now utilizes the USB-C connection for broad and simplified device connectivity. Attention needs to be paid to the details however as USB 3.1 and Thunderbolt 3, while sometimes using the same port, are different protocols. Not all USB-C ports will be USB 3.1, or Thunderbolt compatible. If you purchased a drive or device that is Thunderbolt 3 and your port is USB-C with USB 3.1 support only, like a standard current MacBook, the Thunderbolt device will not be recognized. Your USB-C port MUST also support Thunderbolt 3 to use Thunderbolt devices. Up to six peripherals may be supported by one connector through various topologies for any of the Thunderbolt standards. Compared to Thunderbolt 2, Intel's Thunderbolt 3 controller (codenamed Alpine Ridge) doubles the bandwidth to 40 Gbps (5 GB/s), halves power consumption, and simultaneously drives two external 4K displays at 60 Hz (or a single external 4K display at 120 Hz, or a 5K display at 60 Hz when using Apple's implementation for the late 2016 MacBook Pros) instead of just the single display previous controllers can drive. 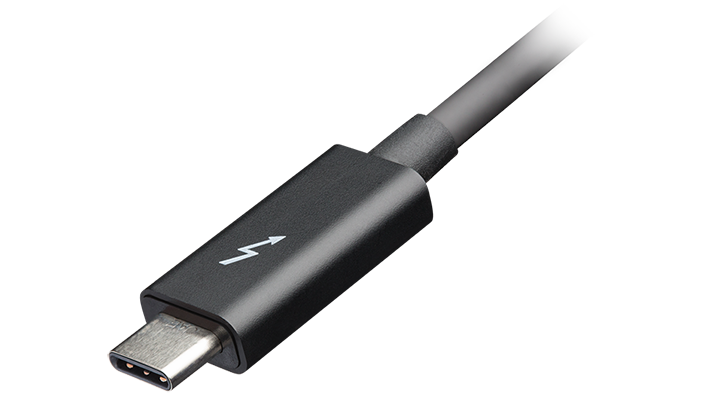 Thunderbolt 3 supports PCIe 3.0 and other protocols, including HDMI 2.0, and DisplayPort 1.2. Backwards compatibility: Solutions and products built to Thunderbolt and Thunderbolt 2 specifications will work with Thunderbolt 3 via an adapter. Io 4K Plus is the cutting edge of capture and output hardware available over Thunderbolt 3, offering a full set of professional video and audio connectivity with support for the latest 4K/UltraHD devices, High Frame Rate (HFR), High Dynamic Range (HDR) and deep color workflows. 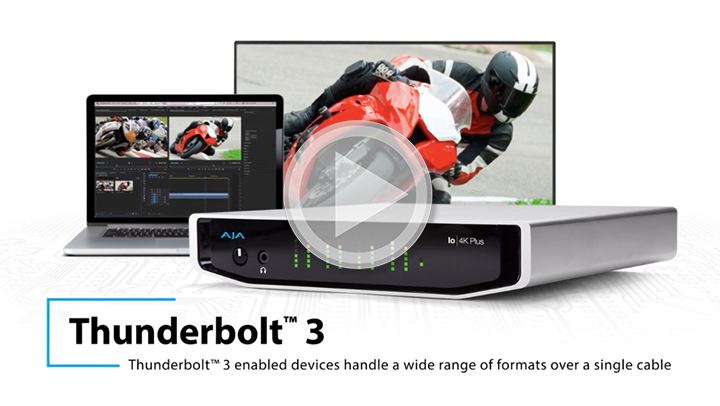 The power of Thunderbolt 3 enables Io 4K Plus to handle a wide range of formats from SD to HD, UltraHD and full 4K with frame rates up to 60p over both 12G-SDI and HDMI 2.0 with single cable simplicity, plus HDR 10 and HLG support over HDMI for emerging HDR workflows. Io IP is a portable Thunderbolt 3 video I/O ingest and playback device for professional HD video and audio over IP based workflows. Io IP has all the portable benefits of the Io product line with two Thunderbolt 3 ports for flexibility. It works with AJA's Control Room, Control Panel software and SDK tools, providing support for leading content creation applications, such as Adobe Premiere® Pro, Apple FCP X, Avid Media Composer®, FilmLight products and more. Designed as a flexible platform with support for SMPTE 2022-6 and 2022-7 uncompressed IP video and audio, and SMPTE 2110 to come soon, Io IP offers you the flexibility to keep current as the IP transition proceeds. Thunderbolt 2 takes Thunderbolt 1 at the physical level and aggregates channels, whereby the two previously separate 10 Gbps channels can be combined into a single 20 Gbps channel. Thunderbolt 2 is able to transfer a 4K video while simultaneously displaying it on a discrete monitor over display port. Thunderbolt 2 incorporates DisplayPort 1.2 support, which allows for video streaming to a single 4K video monitor or dual QHD monitors. Thunderbolt 2 is backwards compatible, which means that all Thunder-bolt cables and connectors are compatible with Thunderbolt 1. The first Thunderbolt 2 product for the consumer market was Asus's Z87-Deluxe/Quad motherboard, announced in August 2013, but the first full product released with Thunderbolt 2 was Apple's late 2013 Retina MacBook Pro, on October 22, 2013. 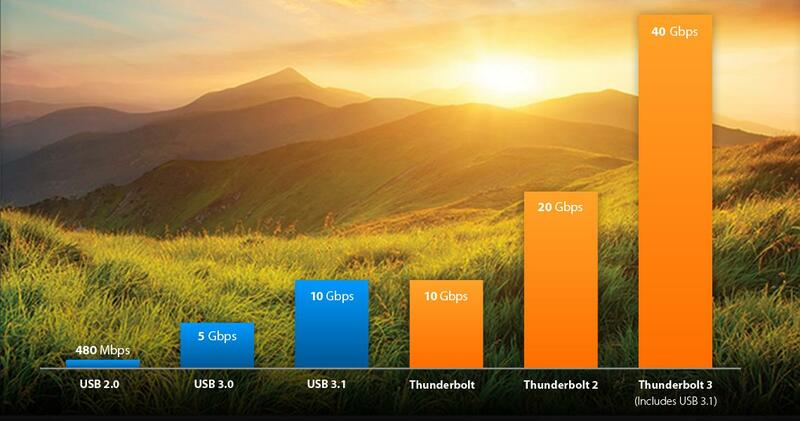 With Thunderbolt 2, there are two bidirectional channels delivering 20Gbps each. That means a single channel has more than enough power to drive a 4K display or high-speed storage device, but if you want to do both things at once you'll need to devote a channel to each one as daisy-chaining won't give you enough throughput. In February 2011, Apple introduced its new line of MacBook Pro notebook computers and announced Thunderbolt availability with MacBook Pros being the first machines to feature the new I/O technology. In May 2011, Apple announced a new line of iMacs that also included Thunderbolt. The Thunderbolt port on all the new Macs is in the same location relative to other ports and maintains the same physical dimensions and pinout as the prior MDP connector. The main visible difference on Thunderbolt-equipped Macs is a Thunderbolt symbol next to the port. AJA's T-TAP provides video professionals with an inexpensive, extremely compact device that utilizes the power of Thunderbolt to deliver high-quality 10-bit 2K/HD/SD-SDI and HDMI video and embedded audio output from any compatible Mac or PC. 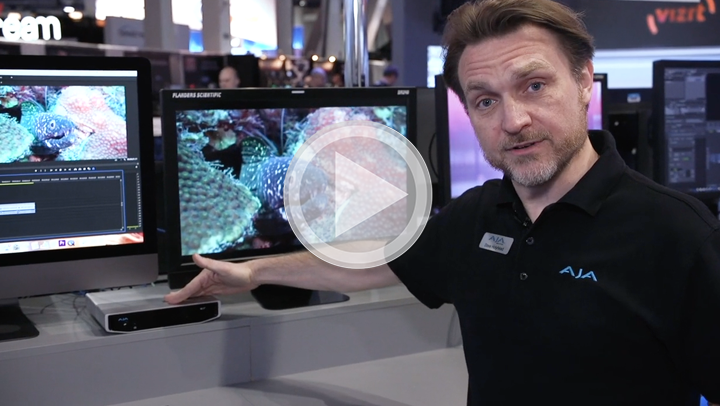 The SDI output can be used to feed professional monitors or recording gear, while the HDMI output is able to feed directly into consumer HDMI monitors. 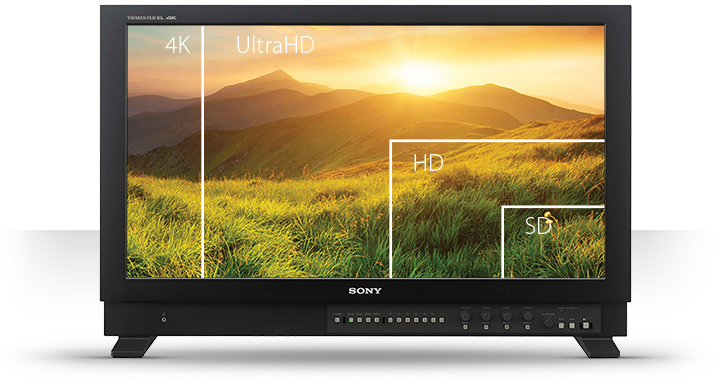 Both HDMI and SDI are active at all times, so you can simultaneously work with professional and consumer gear. External Ki Stor media dock with Thunderbolt™ and USB3 connections for fast transfer of media to a host computer. Perfect for transfer of your Ki Pro Rack media files at high speed to and from a Thunderbolt host computer. External Pak media dock with Thunderbolt™ and USB3 connections for fast transfer of media to a host computer. Perfect for transfer of your Ki Pro Quad, Ki Pro Ultra or Ki Pro Ultra Plus media files at high speed to and from a Thunderbolt host computer.